A star in track as well as football in college, Joe was named MVP of the 1961 Sun Bowl. He was taken by the Broncos in the 11th round of the 1963 AFL draft (the Washington Redskins picked him in the 9th round of the corresponding NFL draft) and filled an immediate need for a solid inside runner. Broncos went 2-11-1 to finish fourth in the AFL Western Division. 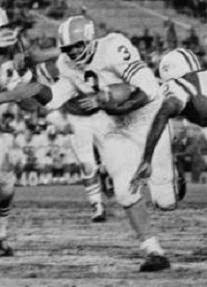 Joe had a lesser season in 1964, rushing for 415 yards, and was traded to Buffalo for FB Cookie Gilchrist, a far better all-around performer who had worn out his welcome with the Bills. After a year in which he ran for 377 yards and had career highs with 27 pass receptions for 271 yards, he was taken by the Miami Dolphins in the expansion draft for 1966. His production continued to diminish and he played two years as a backup for the Jets, as well as one game in 1969 before he was waived. Overall Joe ran for 2010 yards on 539 carries (3.7 avg.) and caught 77 passes for 589 yards (7.6 avg. ), scoring a total of 19 touchdowns. His rookie season remained his best, but he went on to become a successful college head coach, serving at several traditionally African-American schools and compiling an overall record of 243-133-2.